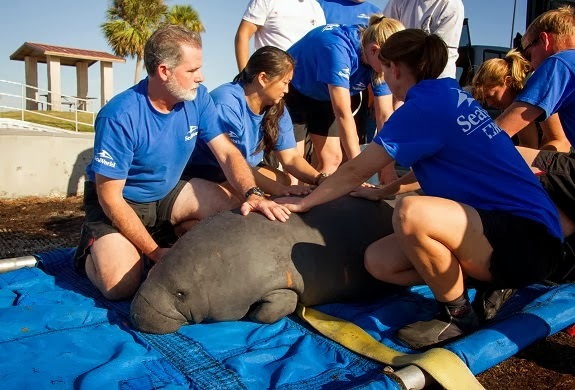 BREVARD COUNTY, Florida – The SeaWorld Orlando Animal Rescue Team returned two female manatees into the Indian River Lagoon this week after receiving treatment and care at SeaWorld in Orlando, Florida for several months. On Tuesday, the Animal Rescue Team successfully returned Vesuvia, a 5-year-old sub-adult female manatee, to the waters of Front Street Park in Melbourne. She was rescued by the Florida Fish and Wildlife Conservation Commission (FWC) in April after sustaining watercraft injuries in the Indian River in Melbourne, Florida. She was transported to SeaWorld Orlando after her rescue where she received radiographs, antibiotics and regular flushing of deep abscesses on her body. During rehabilitation, Vesuvia gained 110 pounds, and weighed 855 pounds when she was returned. On Thursday, Dorothy-Gail, a female independent manatee calf approximately 3-years-old, was returned to the waters at Parrish Park in Titusville, Florida. Dorothy-Gail was rescued from New Smyrna Beach’s Mosquito Lagoon this past May by the FWC and SeaWorld Orlando’s Animal Rescue Team. Dorothy-Gail suffered from watercraft injuries and was transported to SeaWorld Orlando where she received antibiotics, fluids, radiographs and other supportive care. She gained 15 pounds during rehabilitation, and weighed 645 pounds at the time of her return.